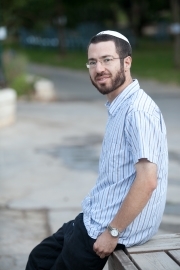 Elhanan Nir (1980) was born into a rabbinic family in Jerusalem and underwent a religious study program in the Talmud Torah and various Yeshivas. At a young age, he was exposed to art in general and to literature in particular and began to write poetry and short stories, and was even published in the daily press and in magazines, without the knowledge of his close surroundings. After his military service, he began studying at the Siach-Yitzhak Hesder yeshiva and later became a teacher there. Since 2012, He also teaches at the Machanayim hesder yeshiva. In 2004 he founded the literary section of Makor Rishon and became its editor, a position he held for seven years. Nir has been in contact with members of the pro-Israel Makuya Japanese movement for more than a decade. After the tsunami, he traveled to the disaster area and gave lectures about spiritual rehabilitation. His books of poetry and Jewish thought won, among others, the Wertheim Prize for Poetry (2008), the Ramat Gan Prize for Literature (2010), and the Prime Minister's Award for Creation (2011). ”Just the two of us” is his first novel .The book won the Posen International Fellowship (2014) and the ministry of culture award (2017). Nir is married to Sarah and has four children. He lives in Jerusalem.